Meet the ever-changing demands of designing structured cabling systems with training in voice/data, telecommunications, bonding and grounding, network infrastructure, project management, codes and standards, and more. Only BICSI, the professional global ICT association, offers the elite Registered Communications Distribution Designer (RCDD®) credential. 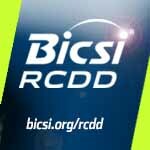 Begin your RCDD training with BICSI today. Many Communication Service Providers (CSPs) attempt ALM through paper trails, spreadsheets, ERP, OSS, or BSS. The problem is that these solutions have one common weakness -- a significant disconnect between what happens with assets in the real world and what is reflected in the asset-tracking database. To have accurate visibility, insight, and control of your assets from end to end, you have to have ALM in the center of multiple systems.